Drivers love the Jeep Wrangler thanks to its iconic design, powerful performance, impressive capability and more. The Jeep Wrangler has changed a lot over the years since its rise during WWII, but one thing that hasn't change is its ruggedness. The new 2018 Wrangler boasts the same power and attitude as previous year models with a number of new highlights. The off-road legend underwent a redesign in 2018 and offer drivers near Calgary a number of new and innovative features, a new engine option and fresh looks. To highlight some of the biggest changes of the 2018 Jeep Wrangler, let's take a look at how the 2018 Wrangler compares to the 2017 Wrangler. One of the differences you'll find between the 2018 Wrangler and the 2017 Wrangler is the overall look and style. The 2018 Wrangler features a redesigned exterior with an updated grille design that is wrapped around the new LED headlights and turn signals. The wider body creates a new and unique style. Another difference between the 2018 Wrangler and 2017 Wrangler is the size. The 2018 Wrangler is about two inches longer (166.8 inches vs. 164.3 inches), offers more cargo space (31.7 cubic feet vs .12.8 cubic feet), offers greater ground clearance (9.7 inches vs. 8.3 inches) and a wider wheelbase (96.8 inches vs. 95.4 inches). While both 2018 and 2017 Wrangler models come fitted with a 285-hp, 3.6-liter Pentastar V6 engine, the 2018 Wrangler offers a diesel powertrain. Drivers searching for a diesel-powered Wrangler can select a 260-hp, 3.6-liter turbodiesel V6 engine. Both the 2018 Wrangler and the 2017 Wrangler offers two- and four-door configurations, as well as FWD and AWD configurations. The truth is, you can't go wrong with a Wrangler. Whether it's a 2018 or 2017, the Wrangler will give you legendary Jeep performance! 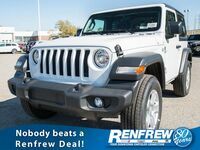 Schedule a test drive of a new Jeep Wrangler at Renfrew Chrysler of Calgary, AB! How Capable Is the New 2018 Jeep Wrangler? Jeep recently debuted the all-new 2018 Wrangler at the Los Angeles Auto Show. The new 2018 Wrangler offers drivers in Calgary the capability that only a Jeep can offer. With a host of improvements and new features that enhance off-road performance, the 2018 Jeep Wrangler is sure to impress. Keep reading to learn more about just how capable the new Wrangler really is!